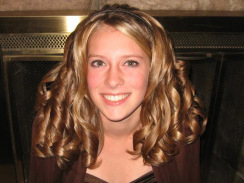 21 year old Kortne Stouffer has been missing since July 29, 2012 when she was last seen returning to her apartment in Palmyra, PA after spending a night out in Harrisburg. However, Kortne Stouffer has seemingly disappeared without a trace as her apartment was found locked and her personal belonging inside, including her purse and cell phone. Her family also stated that her car keys were found inside her car. Stouffer went missing July 29, when neighbors last saw her returning from a night out in Harrisburg. Police do think her disappearance is suspicious since her Palmyra apartment was left locked with personal belongings inside including her purse and cell phone. Her dog was also there. A family member also told WHP that her car keys were in her car. In an interview with CNN Thursday night, Stouffer’s parents said that when she returned to her apartment shortly before she disappeared, she had an argument with a downstairs neighbor and police showed up to calm things down, around 3 a.m. in the morning. Police said they received a second 911 call about a disturbance that night, but when officers arrived, the residence was quiet. Officers reportedly knocked on doors, but no one opened them so they left. Kortne’s mother Wendy Stouffer wondered whether the second call could have been her daughter calling for help. Wendy and her husband Scott Stouffer said that aside from police and her neighbor, a third person may have been among the last to see Kortne. Kortne is 21 years old, 5’8″ and weighs 115 lbs. Kortne has long blonde hair, green eyes and was last seen wearing brightly colored shorts and a yellow tank top. Kortne has several tattoos including “one love” on her right bicep, stars on her left foot and flowers with a pistol on her left hip. The family of missing Palmyra woman now offering $22,500 reward. The police were the last credible source to see Kortne Stouffer as they were called on two occasions on the morning of her disappearance.The first time was at 3:15 am and asked everyone to go back into their apartments. However, when Police responded to a second noise complaint at the apartment building at 4:12 a.m., when the officers arrived, it was quiet. It would appear that this was the moment in time that Kortne Stouffer went missing. Police were called to Stouffer’s Palmyra apartment on two occasions for noise complaints on the morning of her disappearance about two weeks ago, according to Matthew Scott, the family’s spokesman. Scott said that after Stouffer and a male friend returned to her West Main Street apartment after being in downtown Harrisburg, she got into an argument with a neighbor. Police first responded to Stouffer’s West Main Street apartment at 3:15 a.m. on July 29 after receiving noise complaints, Scott said. Police made everyone go back to their own apartments and then left at 3:49 a.m.
That was the last time a credible source saw Stouffer, Scott said. Anyone who has information on Kortne is encouraged to call 717-838-8189 or 717-744-TIPS or email KortneInfo@gmail.com.